I am trying to stay on top of my Christmas to do list this year… in fact, I might even be a tiny, little bit ahead for once! I’ve been working on a number of projects of this year for friends and family and I am LOVING all the fun “Gift in a Jar” ideas I’ve found while browsing around the internets 🙂 I’m starting with this Almond Joy Bar recipe! This gift in a jar recipe whips up quickly and with just a few touches (some ribbon and a label), you’ve got the perfect hostess or gift exchange present! Tip: After adding each ingredient, lightly shake the jar to level the ingredient. You may also use the handle to a wooden spoon to carefully move things around. Adorn the cover as desired with tissue paper, fabric or burlap. Add a tag and a label to your gift in a jar! Pour the jar of ingredients into the bowl and mix until combined. NOTE: Over mixing is not an issue with this recipe so be sure to mix until all the sugar is incorporated well. Almond Joy Bars #GiftinaJar! Who ever gets this gift will be one lucky ducky! I’ve got quite a number of DIY Christmas gift ideas up my sleeves to share with you all over the next few weeks! And this definitely won’t be the only gift in a jar idea or recipe! These make such a great and easy DIY gift, and it is sure to be a hit with whoever the lucky recipient is! It’s beautiful, fun and an easy gift to DIY. Perfection. I love Almond Joy candy bars and think this is a great gift idea. I love this idea. This would be great to give neighbors at Christmas to refrain from cooking this myself.!!! Thanks for sharing. I have it pinned! These look delicious! Almond joy is the hubby’s favorite. I love recipes in a jar, they make great gifts. Thanks for sharing the recipe. Pinning! I would *LOVE* to receive this as a gift!!! It looks wonderful and I just love Almond Joy. 🙂 Thank you so, so much for partying with us at Snickerdoodle Sunday- can’t wait to see what you’ve got next this weekend! Hi Jennifer, this is a great mix for a mason jar, and a perfect time for Christmas gifts. Thank you for sharing on #OMHGFF this week!! I have Pinned to my growing board of Mason jar gifts. this looks great for gifts! stopping by from the home matters party! nice to meet you! I love gifts in a jar 🙂 This is just perfect for Christmas! Thank you so much for sharing. Mhmmmmm…this looks yummy and like a fun gift! This is such a great idea and so pretty! What a great idea! I can’t wait to share these with my family during the holidays! 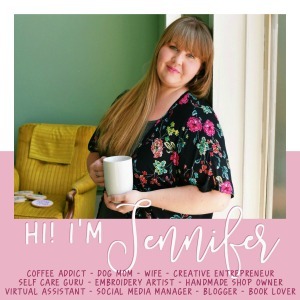 Love your project Jennifer – so inviting! Thanks for sharing it with us at Create With Joy. I love gifts in jars! This is great! I think thats what I’m going to be doing this year for the adults of the family! I know my sister in law enjoys them, I made her a huge basket filled with like 12 different things for her wedding and they loved it! These look great! I might just have to make them for my hubby! Thanks for linking up at the Weekend Wind-Down Party! Hope you come out this weekend! Hi! i tried to make one of these today but I am a bit puzzled. It calls for a quart mason jar but the ingredients well exceed what will fit. Perhaps the ‘quart’ is an error? HI Jackie! There is an error in the recipe. I am so sorry!! Its supposed to be 1/2 cup chocolate chips and 1/2 cup of coconut. So sorry for the mix up! That is so weird Jackie, Mine fit , I have actually made 3 of these and baked one! Maybe since it seems your only off by 1/2 cup worth of space that the ingredients aren’t settled right. IDK. Thanks for the recipe Jennifer love these. Great idea – mason jars are the best so many things you can do with them. Such a great idea! Not only is the gift delicious, but it looks adorable!